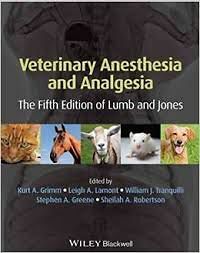 Veterinary Anesthesia and Analgesia: the Fifth Edition of Lumb and Jones is a reorganized and updated edition of the gold-standard reference for anesthesia and pain management in veterinary patients. Encompassing both basic science and clinically relevant information, this edition features a new organization to facilitate easy access to information for sedating, anesthetizing and alleviating pain in patients with various disease conditions. Now in full color, the Fifth Edition maintains this classic book’s reputation as a multi-author, multi-disciplinary, comprehensive reference text while updating the clinical application of this increasingly important subject in veterinary medicine. Fully up-to-date with the latest advances in veterinary anesthesia, the Fifth Edition adds new chapters on anesthetic and analgesic considerations for patients undergoing renal transplant therapy, cardiac pacemaker implantation, and cardiopulmonary bypass. The pharmacology sections have been updated and expanded, and a chapter on euthanasia has been reinstated. Veterinary Anesthesia and Analgesia continues to be an essential resource for veterinary practitioners, specialists, and researchers working with domestic, wild, zoo, and laboratory animal species.